2009 Christmas Greetings to All from ACTION! We just wanted to give you a quick update on how many lives have been touched this Christmas through your generous donation of love, time and toys. 5 Community Christmas Shoppes were held across Ventura County, we will also be sharing toys at the ACTION Ministry Center this week for those who could not get to one of the Christmas Shoppes. 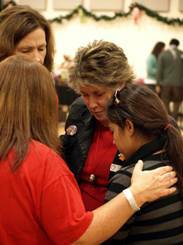 Over 1200 families were blessed and ministered to as they shopped for their families! This represents some 4900 people that came through our Shoppe doors this year, each family in extreme need! 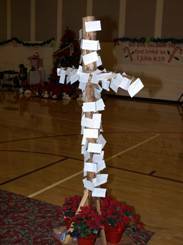 Prayer crosses were covered with requests, families were prayed for and unbelievably blessed. Hundreds of gospel tracts were given out…many, many seeds for Christ were sown…. In total, over 750 volunteers participated in the events! What an outpouring of servants! We were provided with an abundance of new toys, clothing, bicycles and sporting goods, close to 20,000 items in all! With our excess, we also supplied toys to a number of other efforts held by partner ministries in the community including Mercy Ministries, World for Christ, Casa De Vida and hospitalized children suffering from cancer. Another 400+ families were served through these outreaches. Special Thanks to the hundreds of local business, families, City of Thousand Oaks employees, Los Angeles County Sheriff Dept, Ventura County Sheriff Department Volunteers in Policing, Toys for Tots program for their generous donations. We need your ongoing help! If you would like to partner with and see ACTION continue this type of ministry outreach in the coming year, please prayerfully consider a year end donation or monthly partnership. We cannot do this without your support. If you would like to donate, please call the ACTION Ministry Center, 805 987-0300 or return to the home page and click on the link “donate”! The ACTION Staff and Board of Directors would like to thank everyone who has partnered in serving our community this past year. May each of you have a Merry Christmas and we look forward to a new year in serving our Lord & neighbors. Share the post "2009 Christmas Shoppes Update"